‘Waterfall’ is in the laceleaf weeping family of Japanese maples, but unlike the ones that most people are familiar with this one is not red in color. It’s green and it is beautiful! This beautiful Japanese maple is right outside our dining room window. Most of the time I spend working on a computer I work at the dining room table simply because of this view. At the time of this writing it is April 22nd and when I looked out the window this morning I was simply mesmerized by the sight of this magnificent little tree. So much so that I grabbed my camera and went out the door to snap some photos. I don’t feel that even these photos do this tree justice. Right now the foliage is almost fluorescent green. Very, very vivid! I’ve had a number of these ‘Waterfall’ Japanese maples in my landscape for years. They do really well here in zone 5 and will probably do equally well up to zone 8. Like most dissectum Japanese maples the edges of the leaves turn slightly brown in late summer. It is said that regular watering can prevent that, but I am always leary of telling people to water Japanese maples on a regular basis because if the soil in your yard does not drain well it’s very easy to over water them and they do not like wet feet. Nor do they like a lot of fertilizer. Please do not over fertilize your Japanese maples. You can easily kill them with too much fertilizer. How about that fall color? From fluorescent green to a beautiful burnt orange! A little shade is always beneficial to a dissectum Japanese maples because it gives the foliage a little break from the sun in at least part of the day. It is necessary? Not in zones 5 or 6, but in warmer zones it would be beneficial. With that said, I grow Japanese maples in out in the field, in full sun. All kinds of varieties and they do just fine. Yep! That’s how winter hardy Japanese maple ‘Waterfall’ is. That’s why I love Japanese maples so much. They are constantly changing throughout the year. I took this snow covered photo in January of this year and just a few months later I’m enjoying the same tree covered in spectacular green leaves. I love my job! You too would absolutely love being in the plant business. How much would a tree like this cost? That depends on the size, but they can be pricey. I routinely see them in garden centers for $150 up to $300, but get this; I bought a bunch of them for less than $10.00 each. That’s the beauty of being a member of the trade. I actually bought some for $6.95 each and I’ll be planting those in the field this week. Can you become a member of the trade and get these deals? Yes you can! Click here for details! The japanese maples are lovely. Hi Mike I live in zone 9 and would like to grow maples, but will they grow here??? Thanks for all the good info! I am in WI ! How will the japenese maples do here? Thanks and happy growing season! I too love Japanese Maples and this waterfall is just breath taking. Thanks for sharing! mike,i love your newsletters! i would love to have a plant business too,but i live in a small apartment near cincinnati,& dont have the room.i wish i did,because i would sure make some money!i do have a very small limited garden space where i have flowers,& plant tomatoes,& a cucumber plant or 2. ,and a few green beans.i always grow plants from seeds..i grew up in the country so its not new to me.i would love nothing more than to have my own garden.you are an inspiration ! there’s just nothing else that compares to working in the garden & growing your own plants is there! ?you & your wife just keep up the good work of gardening! god bless you & yours! That is a gorgeous tree, Mike. How long does it take to grow a JM to that size? Are all weeping JM grafted? Betsy, most Japanese maples are grafted, but not all. I also have a waterfall maple and it got some damage by the hail storm we had. It is located in a breeze way between the garage and house and has taken on a wind swept look. I love it. This is a beaitiful tree. You shoould see our mockorange shrub and climbing rose in Kentucky. We have a knockout red rose at the mailbox. Do you ever cut and root these Waterfall Japanese Maples yourself. Is there a perfect season to do this? I always thought the Japanese Maple takes at least ten years to grow to the height in the photo. Mike should have mentioned how long it takes to grow. Ernie, they are slow growing, and that’s what makes them so special. The one in the photo I’ve had in my landscape for 7 years and it was growing several years before I got it. And that’s why I like them so much. How tall will the JM get. I have tried to plant trees in my front yard for years. Once planted, they seem to grow but die later on. Will this Japanese tree bee a better choice? Can you suggest a strong hearty tree that would thrive? Only want the tree to grow to about 15 feet with a 10 foot radius. Can you help? Rhonda, if you are losing trees there has to be a reason. Usually planted too deep or the soil is too wet. Plants want to grow and given the correct conditions they will grow just fine. Which plants do you recommend for zone 9? Thank you. I live in Duluth, MN and grow them in large pots, they’re beautiful! I just bring them in for the winter into our garage that is heated only to about 40 degrees, so they still go through a seasonal change. Just water them every once in a while and they’re ready to come out in the spring with leaf buds starting. We do not have these available to us. Mike, I have one of these in my back yard. Mine appears to be about 3/4 the size of the one pictured and just as beautiful. We have had a Very warm spring. A few weeks ago, we had a cold night. Now half the leaves are brown and dead on this tree. Nothing else in our yard was effected, even the Japanese Maple in the front yard. Will this tree recover? It has grown so much since planting two years ago. Steve, more than likely it will make new leaves. It will just take some time. This is how you test to see if a plant, or a branch on a plant has died. Just scratch the bark of your plants with your finger nail. If the tissue below the bark is green and firm your plants are fine. If the tissue is brown and mushy that part of the plant is dead. I’m absolutely addicted to these kinds of plants. I have the red water fall Tamukeyama. I live here in Las Vegas and can actually grow these little guys here in the hot desert. Thank you for all the great info you put out each week. I too live in Vegas and been researching if I can grow these japanese maples. Can you give me some tips? I am obssessed with it. But, all indications points it to be very difficult to grow. Talked to Plant World nursery who used to have some 3 years back not lately. I’d really appreciate it. Thanks. Your Japanese Maple waterfall is gorgeous as is most of the plants you put on your site. I sit by my window unable to get outside due to health problems and your beautiful tree and thought what a beautiful sight it would be for me to wheel up to every morning. Where can I buy one? I am unable to buy in quantity and do as you do but is there somewhere I can buy one. I can get someone to plant it for me. Thank you. I live 40 miles from there and will have someone take me there Sat. I see all your nice trees, but I live in zone 4 and don’t see many that will survice in our zone. Show us some nice trees that we can grow also. I live in Southern S.E. Alaska, which is also Zone 4, and I have several Japanese lace leaf maples, that are all thriving. I just purchased a Waterfall JM and plan on putting it into a tall container so it can cascade down the front. I am going out this afternoon to look for one of these spectacular appearing Japanese maples. Thank you for sending me all the advice, I review my own folder to answer some questions each season. Enjoy the architecture of the tree in winter. I live in SE Mississippi. I would love one of the weeping laceleaf Japanese Maples, but I have been told they will not live in our area. Do you know of one that mght possibly survive our heat and where I can get one that is not so costly? Amy, I need to research Japanese maples for warmer climates. I will and I will let you know. Would love this brilliant tree in my high desert landscape…maybe the one from Vegas reader ? I must also deal with “open range” yard…that includes Javalina and cows….I protect plants /trees with bird cages,tomato/vine wire/other until they are more mature…or just stick to “list” of plants,trees that Javalina don’t crave. Cows love roses…who woulda’ thought? I appreciate any ideas about the Japanese Maple or the Water Fall. Thanks for such a neat site…it would cost more then $10,000.00 to fence my place for growing so nature’s pets and I …just continue the battle each day. After 7 years, we have a tie. I have just purchased my first Japanese Maple(red). My 4 year old grandson & I planted it to commemorate his 4th birthday. I like the fall version of your Japanese Maple Waterfall. Simply gorgeous! We are in zone 7/8. There is one of these in the neighborhood- and after pricing them- I often look for seeds around it. Do they seed like the large variety? Also, is their root system similar to those large varieties? I put ice plants, coneflowers and Missouri Evening Primrose at the base of my River Maple and Sugar Maple. Would like to have other suggestions!! I absolutely believe in the propagation process and reproduction of more plants or flowers. I’m impressed and sold on these Japanese Maples species of plants/ trees, therefore I plan to use their popularity in my own plant growing business, after I receive my Backyard Growing system next month. Thanks Mike! Jane, my advice is to find a couple of small ones and just take a chance. In my opinion they are worth the risk! 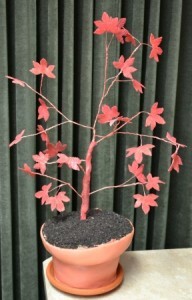 Can you make a clipping of a red japenese maple tree and root it too grow another tree?..years ago my mom gave me a beautiful red japenese maple tree and I would like to make another tree out of it and plant it in another part of my yard???? Love that orange color in the fall! Is the whole tree that color every year? I am used to trees that have different colors in them during autumn. Aileen, of course we’re at the mercy of Mother Nature. They do turn that color every fall, but for how long really depends on what the weather does. I am really exciting about this plants. i am in Africa,Ethiopia so can this plant grow here?how can i get the seeds or cuttings of this plants? Mike we are so fortunate to have your backyard growers information. Here in Victoria , Australia we are able to go our and see these beautiful trees and make our selection. looks like part of my day today might be set aside for just that! I love propagating and am amazed at the responses from our customers who say “Did you grow that?? WOW!! ” a good feeling at the end of a busy day selling and making plants. and we can do it here on the other side of the world just as easy , if not easie,r as our weather is pretty kind to us, considering. Hi Lois, I have just purchased Mikes amazing program. Glad to see another Aussie! I’m on Central Coast NSW. Do you know of an online support for all of us Aussie backyard growers? I’m a newbie and would love to find what other people think about propagating our native plants. Almost 30 yrs ago I planted 2 Japanese lace maples in the front of my house…Today one of them is talled than the eves on our house and absolutely lovely. The other, because of a christmas lighting accident LOL lost its top, but its managed to grow quite well since then. Every year I trim the dead branches from the underside of the big tree (Yes its high enough in there to walk around) Mine are a deep crimson red and I love them, I’ve not tried to grow any but now that I’m retired I’ll give it all a go…will let you all know how it goes. 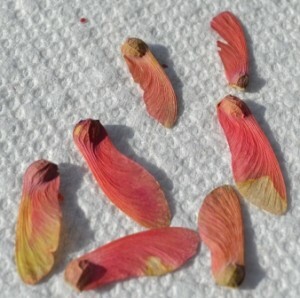 Hi I ve needed to seed or cutting Japanese maple . could you give me ? is it very difficult to get olive tree seeds and bamboo seeds to sprout? It’s too early for those seeds to be viable. Wait until late Sept, early October to collect the seeds. They have to stay on the tree until them to mature. Hi Mike I saw your tree posted on Pinterest too. I have a Waterfall Japanese Maple, but I think mine is a little bigger. I am 5’4 and the top of mine is now above eye level for me. We planted it 10 and a half years ago, and it just gets more beautiful every year. It is hard to choose a favorite time of year for this tree, it is gorgeous in all of them. I am located just north of Atlanta, and this tree seems to love this climate.. I would love to buy one of the Acer Palmatum Dissectum – Waterfall. I live in zone 5. We have a Japanese Maple “Waterfall”. It has been planted about 2 years. The top of the maple has a yellow burnt look to it and also the same within the tree. What can we do tto help this beautiful tree go back to its orginal beauty. We did not know if the last frost would have damanged this or not. We live in Kentucky. Connie, it’s probably frost damage. Mine looks the same way. It will come back slowly, not much you can do to speed the process. I have just purchased a japanese maple. We chose it as a vocal point to our developing perennial raised flower bed. The leaves are begining to brown and I am concerned if it is getting too much sun. We live in zone 7 and this tree gets sun from the morning till about 4pm. Would it survive in a very large pot and moved in the shade? Depending on the variety some Japanese maples don’t like a lot of sun, at least when they are young. I grow them in full sun, but I’m in zone 6. A pot in the shade would work, but it really would be happier in the ground. I have a beautiful Japanese maple in my front yard. I would like to know why I can’t seem to ever find seed pods on it? I have a large (10′) green Japanese maple. Unfortunately it was planted in a spot 30+ years ago in a location that is less than ideal for a tree this size. I wanted to know if anyone has any suggestions for relocating or possibly selling the tree. The tree was planted only 2′ away from my septic tank making it impossible to get heavy equipment to dig it out. Possibly could pull it out of the soil with a machine (after dug by hand) but only using some type rope. after the first few feet it could be picked up with forks. Biught our first waterfall J. maple today and will plant it Tuesday as we are re-soodibg our front yard due to the removal of abeautiful, but extraordinarily detrimental, Balding Cypress. This tree is about 4 feet tall. Cannot wait for it to mature! We live in northern suburbs of Atlanta, Ga.
Goodness, so many typos! Meant “Bought out first waterfall green Japanese maple” and “re-sodding” our Bermuda lawn. Sorry. I live in zone 6B in London Ontario. I have dwarf weeping red, Japanese maple that is a 3 years old.. It got leaf scorch last summer and lost the back of the tree (it faces west) . I am going to move it to nurse it back to a good shape, and will plant another in its stead. I am leaning towards a Waterfall, even though I would prefer a red one, but I am concerned that It might get too tall. I think that maximum 4 feet high and 3-4 ft wide would work. Any thoughts or suggestions? Thanks. Is it possible to keep it from getting so wide – eg pruning? Is there another variety that you would suggest? Thank you. I think it’s a good choice, just prune it to the size you want once a year. Do you have any other japanese maple varieties to suggest for that size and location. Could I control the width of the “waterfall” by pruning? And if so, How would I go about doing that? sorry, I didn’t see the first one posted. can I grow the Waterfall in full shade? Yes, if the shade is deep it might get thin over time. If I had to chose between full sun and full shade I’d chose the full sun unless the tree is really small. I learn something new from you every day. I thought Japanese maples liked lots of moisture. Your article says to run them on the drier side. I want to plant maybe a half-dozen various cultivars around my pond which is overloaded with Joe Pye, Queen of the Prairie (Filipendula rubra), Loosestrife, yellow flag and other marginals. A few yards further back and uphill from waterline, sycamores, red (silver?) maple, dogwood and redbuds do great. Thoughts on whether Japanese maples tolerate similar conditions as other trees mentioned? Thanks. They like it high and dry, but do need water like any other plant. But it has to drain away quickly. Do not plant them too deep. Your Waterfall Japanese Maple tree is truly beautiful. I bought a Waterfall about 3 months ago It was so pretty but now the leaves are turning tan all around the edges throughout the entire tree. After fertilizing the tree, it does have new all green growth the way it should. I have it a pot and put all the specific soil that the nursery told me to use as well as this fertilizer. It only get about 3 hours of afternoon sun. I even put an umbrella to shade it from the sun because I thought that this was the problem. But it just continue to get more tanish around the leaves. I really want to save it and have it look like yours or at least green. I’d much prefer to the see the tree in the ground. But for now, no more fertilizer, water as needed. Spring will bring new leaves.